How much does a certificate cost? How long does it take to get a certificate? What should I do if I lose my birth certificate or it gets stolen? Is my payment transaction secure? What is the Service Guarantee for birth certificates? What is the Service Guarantee for marriage/death certificates? What address should I provide on the application? How do I contact the Office of the Registrar General? My name contains letters with accents. How do I enter these characters? What do I do if I experience a technical problem and the information I have entered on the form is erased? What if I submitted an application form by mail/fax/in person and now want to submit it online - will I get a refund? I applied for one certificate but I was billed for two - will I get a refund? How can I get expedited or emergency service? What is a Premium Online Service? Can I review my completed online application before I submit it online? Is my information sent online? Can I electronically save the application I send online? If I use the printed application, is my information sent online? Can I electronically save the printed application? If I enter my credit card information on the printed application, will it be charged online? Can I send my printed application by email? What information do I need to provide on the Online Birth Certificate Application? Who is entitled to apply for an Ontario Birth Certificate? How do I register a birth in Ontario? What type of birth document is required to obtain a Canadian passport, social insurance number (SIN), Ontario Health Card (OHIP number), or Ontario driver's license? My child's birth hasn't been registered and I am required to travel with my newborn. What can I do? Do I need a certified copy of birth registration? What is the difference between a Birth Certificate, a Birth Certificate with Parental Information and a Certified copy of a Birth Registration? I am an adoptee or adoptive parent. What information do I need to provide? Who is entitled to be a guarantor? Can a family member or relative be a guarantor? How long will it take to get a birth certificate? Where can I get a birth certificate application form? How can my child travel before his/her birth is registered? Where can I submit my printed application? Where should I keep my birth certificate? How do I register a marriage? What information do I need to provide on the Online Marriage Certificate Application? Who is entitled to apply for a marriage certificate? Who is entitled to apply for a certified copy of marriage registration? Who is entitled to apply for a marriage certificate if one or both of the parties to the marriage is deceased? Who is entitled to apply for a certified copy of marriage registration if one or both of the parties to the marriage is deceased? What information do I need to provide on the Online Death Certificate Application? Who is entitled to apply for a death certificate? Who is entitled to apply for a certified copy of a statement of death? When do you need a death certificate? To protect the security and confidentiality of our customer's information, the Office of the Registrar General uses industry standard Secure Sockets Layer (SSL) encryption to process online credit card payments. When the INTERAC Online service is used, the payment is completed through the financial institution's systems and over the same secure network used for INTERAC Debit. If you do not know the exact date of an event (birth, marriage or death), you may request a search. A search verifies that an event has taken place and has been registered with the province of Ontario. There is a $15.00 fee for each period of up to 5 years you request to have searched. Provide the address where you want the Office of the Registrar General to send the documents. If you have a Post Office box, you must also provide an address with a street name and number. You are only required to use the Delivery Mode and Route number fields if you live in a rural area. Ensure Num Lock is on. Hold down the Alt key and type the number listed below using the Numeric Keypad on the right side of your keyboard. When you release the Alt key, the character will appear. Your information is lost and you will have to re-enter the information. Every person who submits an application for a certificate and thereby requests that a service be performed by the Office of the Registrar General must pay the required fee. If you submitted multiple applications for a birth certificate, all applications will be processed, however, multiple certificates will not be issued. Only the most recently issued birth certificate and certified copy of the birth registration will be valid. Any previous copies will be deactivated. As processing has occurred, you are not eligible for a refund. If you submitted multiple applications for a marriage or death certificate, all applications will be processed. As there is no restriction on the number of marriage or death certificates a person may apply for, processing has occurred and you are not eligible for a refund. If you did not submit multiple applications, whether by mail, in person or online, and you have been charged more than once, you may submit a Request for Refund form for evaluation. Where rush service is required for a birth, death, or marriage certificate, customers may be able to apply for the Premium Online Service option. Eligible applications (see Terms and Conditions) are processed and delivered within 5 business days. Where applications are eligible for premium processing, a $30.00 surcharge will be applied per document requested. Note: At this time Service Guarantees are not available for a Birth Certificate with Parental Information. There are a number of opportunities to review sections but you cannot see all of the information at once. The Office of the Registrar General does not provide a method by which you may review your application online. Upon successful submission of your online application, you will be presented with a payment receipt. The payment receipt includes information about the products you selected, and your order and payment confirmation numbers. The Office of the Registrar General recommends that you print the payment receipt for your records. After your credit card has been charged or after completion of an INTERAC Online payment transaction, your information is sent electronically to the Office of the Registrar General. No. There is no method by which you may save your application electronically. Upon successful submission of your online application, you will be presented with a payment receipt. The payment receipt includes information about the products you selected, and your order and payment confirmation numbers. We recommend that you print the payment receipt for your records. No, the information you enter into this form will not be captured or sent electronically. No, the information you enter into this form cannot be saved electronically. No, your credit card will not be charged online. The Office of the Registrar General will charge your credit card only when the application is received. No. You cannot send an application by email. You will be asked to provide the following Information when completing the Online Birth Certificate application. Information that appears with an asterisk ( ) is mandatory and must be completed on the application. Guarantor Information is only required for subjects that are age 9 or older. Is the Guarantor a Canadian citizen? Has the Guarantor known you for two or more years? Has the Guarantor authorized you to provide their information? Has the person named on the Birth Registration ever had a legal name change? If yes, you must provide their previous legal names. A legal name change involves legally changing a person's first name(s) and/or last name or single name. 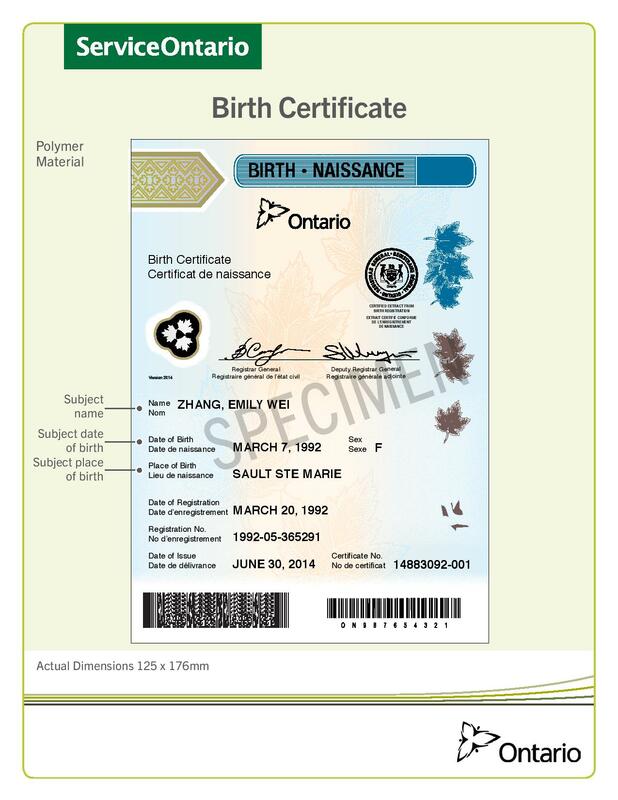 When your name is legally changed in Ontario, you are issued a birth certificate indicating the new legal name(s). A birth certificate is a legal document used to provide an identity. The birth must be registered before a birth certificate can be issued. There are three types of birth products available. Make sure you order the right certificate! *Note: For older (pre-1970) registrations, parent(s)' place(s) of birth may not have been recorded and therefore will not appear on the certificate. 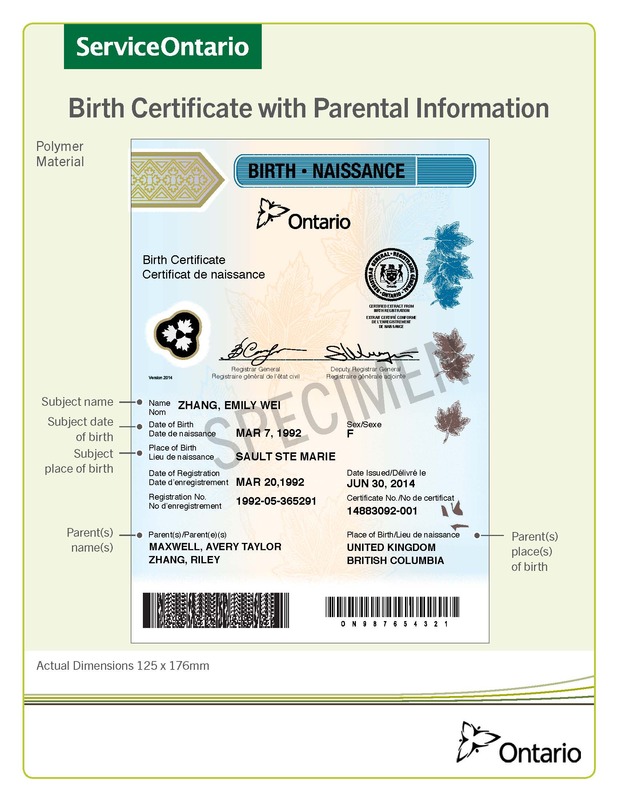 This certificate includes parental information, in addition to the subject's information and is recommended for newborns or children under 16 years of age where parental information is required and can be used for the same identification purposes as a birth certificate with only subject information. A certified copy of the detailed registration filed after birth, also known as the Statement of Live Birth, contains all registered information about a birth. The copy is endorsed as authentic, printed on legal sized paper, and contains a raised seal for security and verification purposes. Safeguarding your personal and sensitive information is important. Given the amount of information contained in a Certified Copy of a Birth Registration it is not recommended to share this document unless expressly required. When completing the application, provide the adoptive parents names and the current legal name of the adoptee. Yes, provided that he or she is a Canadian citizen, has known you for two or more years and his or her occupation appears on the list of qualified guarantors. Historical events, such as births prior to 1930, may not be in electronic format. When applying for a birth certificate for a birth prior to 1930, it can take up to an extra 6-8 weeks for the registration to be converted into electronic format before processing can be completed. Records that are not available electronically are not included in the Service Guarantee. First and last names or single names of both parties to the marriage (Brides and grooms are referred to as parties to the marriage). City or town of marriage. There are restrictions on who may apply for a marriage certificate. The parties to the marriage, children of the marriage, parents of the parties to the marriage and legally authorized representatives acting on behalf of these individuals are entitled to apply. Authorized representatives are required to provide proof of authorization. The parties to the marriage, and a legally authorized representative acting on behalf of either party to the marriage are entitled to apply. Authorized representatives are required to provide proof of authorization. Brides and Grooms are referred to as the Parties to the marriage. Who is entitled to apply for a marriage certificate if one or both of the parties to the marriage is deceased? The surviving party and Next of Kin - the parents of either party, children of the marriage and siblings of either party. If all the Next of Kin are deceased, extended Next of Kin may apply. Extended Next of Kin relationships include aunt, uncle, first cousin, grandchild, grandparent, nephew or niece. Authorized representatives may also apply. The Office of the Registrar General requires you to certify online that you are the Next of Kin or, that, the Next of Kin is deceased and you are the Extended Next of Kin. The legally authorized representative of an entitled individual, including the deceased, may apply for a certificate or certified copy of the marriage registration. Historical events, such as marriages prior to 1965, may not be in electronic format. When applying for a marriage certificate prior to 1965, it can take up to an extra 6-8 weeks for the registration to be converted into an electronic format before processing can be completed. Records that are not available electronically are not included in the Service Guarantee. If applicable, information about his or her spouse or partner. There are no restrictions on who may apply for a death certificate. The deceased's Next of Kin or their authorized representative may apply for a certified copy of a statement of death. Next of kin of the deceased includes his/her parents, spouse or common-law partner, children and siblings. If all the Next of Kin are deceased, Extended Next of Kin or their authorized representative may apply. Extended Next of Kin relationships include aunt, uncle, first cousin, grandchild, grandparent, nephew and niece. Historical events, such as deaths prior to 1980, may not be in electronic format. When applying for a death certificate prior to 1980, it can take up to an extra 6-8 weeks for the registration to be converted into an electronic format before processing can be completed. Records that are not available electronically are not included in the Service Guarantee.